TDE: Congratulations on being re-elected unopposed as International Telecommunication Union’s (ITU) Secretary General. Tell us a little about ITU and your specific role? 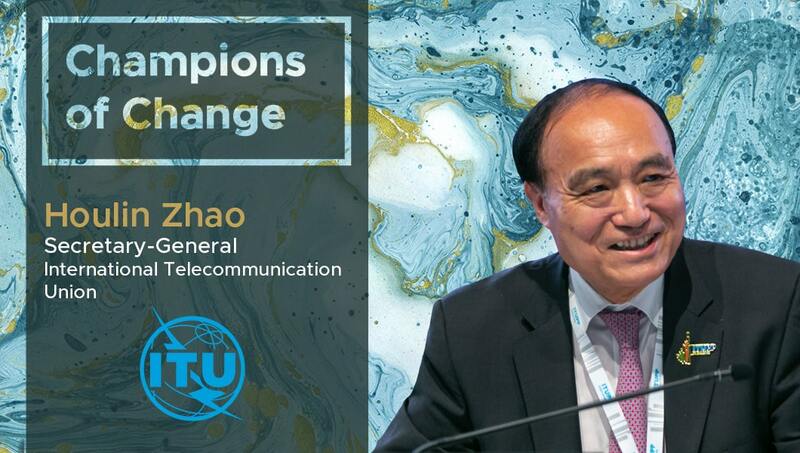 Houlin Zhao: Thank you very much, it is an honor to have been selected again by ITU’s Member States to represent them as Secretary-General for the next four years. I look forward to supporting their needs and representing their perspectives as we continue to work together to advance the information and communication technology (ICT) sector for the benefit of everyone, everywhere. ITU plays an important role in this regard, as it serves as the specialized agency of the United Nations for ICTs. ITU is driving innovation in ICTs together with its 193 Member States and a membership of more than 700 companies, and more than 150 academic institutions and civil society organizations. Established over 150 years ago in 1865, ITU is the intergovernmental body responsible for coordinating the shared global use of the radio spectrum, promoting international cooperation in assigning satellite orbits, improving communication infrastructure in the developing world, and establishing the worldwide standards that foster seamless interconnection of a vast range of communications systems. From broadband networks to cutting-edge wireless technologies, aeronautical and maritime navigation, radio astronomy, oceanographic and satellite-based earth monitoring as well as converging fixed-mobile phone, Internet and broadcasting technologies, ITU is committed to connecting the world. How will you compare the adoption of digital technologies in the global telecommunications sector as compared to other industries like banking, healthcare, insurance etc? Houlin Zhao: What we are seeing is that emerging ICTs such as Artificial Intelligence, the Internet of Things, 5G and others are driving the advancement in the banking, healthcare and insurance sector in ways that will change the way we live and work. So rather than comparing the two, it is a case of ICTs playing the important role of enabling important advancements across many sectors. Examples of this include the rapid expansion of eHealth that will enable remote communities to access and benefit from quality healthcare and the ability of the world’s millions of unbanked people to access and benefit from mobile banking. TDE: What are some of the specific challenges that the sector can resolve by bringing in a digital outlook in their functioning? What are your 3 key suggestions for the leading players to action this? Houlin Zhao: One of the biggest challenges is to ensure that in our increasingly digital world, the digital gap between developed and developing countries does not expand, but rather that it is bridged. ITU plays several very important roles in this regard. The first is our ability to convene government policy-makers, corporate leaders, academia and civil society so that they can work together to create an enabling environment where ICTs can support economies and societies. The second is our mandate to establish global standards for ICTs, which works to maximize their inter-operability and as such, the number of people that can benefit from them – for example a mobile smart phone being used in a developing country should be able to access as many online resources as that of one used in a developed country. The third is our support for ICT innovations, which is why it is so important to support small- and medium-sized enterprises, as they are often the breeding ground for new ideas. In addition to taking part in these processes, leading players can support the development of digital skills that will enable users to benefit from digital technologies once they have access to these. We must remember that even with connectivity, digital skills are still needed to be a user of digital technology. I also encourage all ICT stakeholder groups to become members of ITU. Many people are not aware that any entity can become a member of one or all three of ITU’s three sectors – Standardization, Radiocommunication and Development. This provides everyone with the opportunity to play an active role in defining the future of the ICT sector – whether they represent large or small companies, government agencies, academia or civil society. What is your/ITU’s vision for a completely digitized telecommunication sector and what are some the broad benefits this will bring about – could be greater connectivity in remote locations, the impact of 5G on collaboration and networking etc? Houlin Zhao: We are already seeing not only the realization of a digitized telecommunication sector, but of a digitized world. One example is the emergence of Smart Cities in all corners of the world. These are a very effective way to bring a host of digital resources to a specific community in ways that improve the way its residents live and work, while also minimizing the negative impact of the community on the environment and natural resources. ITU has supported the advancement of Smart Cities through its role with the United for Smart Sustainable Cities (U4SSC) initiative, which has developed Key Performance Indicators (KPIs) for Smart Sustainable Cities. ITU is now publishing a series of smart city case studies, which seek to capture and share lessons learned by those cities at the forefront of smart city design and management – so that other smart cities can be established using best practices. TDE: Could you share an example of an awe-inspiring telecom digital transformation? Houlin Zhao: Certainly the roll-out of 5G, or IMT-2020 as it is officially known, will dramatically change the ways in which we live and work. The ability of 5G technology to transfer information at a speed never seen before, and with a very low level of data loss, will open the door to the development of innovations that are beyond our current imagination. Already, 5G is poised to make cities of self-driving vehicles a reality, as it will enable critical information to reliably reach the vehicle in a split second. 5G is also driving the Internet of Things, so the growing number of connected devices that we have in our home and at work can communicate with each other for increased efficiency. Developments that we are seeing in the satellite communication industry will also change the world and could have a significant impact on the ICT sector. Micro-satellite arrays are being designed and launched today that will play an important role in connecting half of the world’s population still not connected to the Internet. This will dramatically improve the livelihoods of millions of people by giving them access to digital resources and critically important social, financial and health benefits. From an industry standpoint, this will open up the world to new markets for digital products and services, while also creating an enabling environment for entrepreneurs and small- and medium-sized enterprises. This has the potential to create new levels of innovation in the ICT sector. What’s next on ITU’s digital roadmap? What are some of the upcoming technologies that in your opinion can make a huge impact on telecommunications? Houlin Zhao: ITU is already looking into the future at technologies beyond 5G, with the launch recently of a new research initiative to identify emerging and future ICT sector network demands, beyond 2030 and the advances expected of IMT-2020 (5G) systems. This work will be carried out by the newly established ITU Focus Group on Technologies for Network 2030, which is open to all interested parties. The ITU focus group aims to guide the global ICT community in developing a “Network 2030” vision for future ICTs. This will include new concepts, new architecture, new protocols – and new solutions – that are fully backward compatible, so as to support both existing and new applications. These ICT use cases will span new media such as holograms, a new generation of augmented and virtual reality applications, and high-precision communications for ‘tactile’ and ‘haptic’ applications in need of processing a very high volume of data in near real-time – with extremely high throughput and low latency. Houlin Zhao: Of course, this would be the ITU website for all the latest advancements being made in the ICT sector by ITU and our Members. For thought leadership perspectives from ITU, a variety of well-respected industry insiders, academia and other ICT stakeholders, as wells as news on emerging technologies, the ITU News Magazine and the ITU News daily blogs are essential – news.itu.int. Subscribing to both news channels and following @ITU will give all ICT stakeholders access to the latest news and information. TDE: Read a good book lately on digital transformation that you’d like to recommend to our readers? Houlin Zhao: The recent passing of a man for whom I have a great deal of respect both as an individual and a world leader, the late United Nations Secretary-General Kofi Annan, brings me to recommend the most recent book he authored, A Life in War and Peace. While it may not be a book on digital transformation, it certainly provides guidance on contributing to the positive transformation of the world. The thought-provoking reflections, experiences and perspectives that Annan shares in his book are certain to encourage anyone to want to contribute to creating a better world. And for those of us in the ICT sector, the lessons he shares serve as encouragement to continue to leverage ICTs to the benefit of everyone, everywhere. For more insights follow Mr Houlin Zhao on Twitter.